Do you ever get that pit in your stomach when you’ve realized that you just used your last twenty dollars to buy a few groceries and the next paycheck doesn’t hit up for three more days? If so, you’re not in that boat alone. The struggle of living paycheck-to-paycheck in the United States is an epidemic. According to a survey of 1,000 adults released by Bankrate.com in 2013, fewer than one in four Americans have enough money in their savings account to cover at least six months of expenses, enough to help cushion the blow of a job loss, medical emergency or some other unexpected event. Meanwhile, 50% of those surveyed have less than a three-month cushion and 27% had no savings at all. Those statistics are more than a little unsettling. These solutions are absolutely spot on- but they are also drastic changes that require immediate attention, significant willpower, planning time, and steadfast commitment. This can be an intimidating list of “to do’s” and “not to do’s,” particularly for young people in their 20’s and 30’s who want to make changes, but also don’t want to entirely give up their life as they know it. So what’s the answer? Aren’t there some intermediary steps that people can take? I was discussing this very issue with my colleague Matt Reiner (a millennial himself) a few weeks ago. We agreed that change is necessary in order to break free from the vicious paycheck-to-paycheck cycle, but that middle steps are just as essential. He shared a few great tips with me that will make a big difference to your wallet yet still allow for an enjoyable lifestyle. These steps are meant to help you get from where you are today to where you want to be. 1. Pay yourself. First, be sure that you have a savings account set up. Log onto your online bank account and set up an auto transfer into a savings account. Determine the amount of the transfer, which can be as low as twenty dollars a month- the point is that you’re automatically saving something. Hopefully, you’ll see the money start building up and catch the bug of wanting to save more to increase that balance. If you don’t catch the bug immediately, that’s alright. The fact is that you’re still saving which is a great step in the right direction. 2. Go the grocery store on Sunday. You don’t actually have to go to the grocery store on Sunday, but the point here is to select one day a week to go. 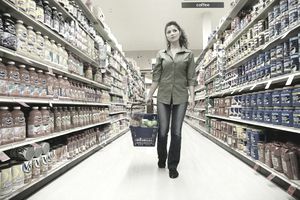 We all have the best intentions when we run into the grocery store to grab that “one item.” But inevitably that carton of milk or loaf of bread morphs into an overloaded grocery cart with a bunch of needless items. You leave the store spending $80 instead of the $5 you had intended- and think about how far that $75 could have gone if used differently! Keeping your grocery shopping to one day a week instead of multiple times a week allows for opportunities for savings. 4. Lease a (Nissan) Leaf. This is definitely not a sales pitch to go lease a Nissan Leaf, and please don’t run out to the stores. However, if find yourself spending the majority of your paycheck on gas every month, this may be a great option. There could be potential immediate savings in leasing a Leaf and ones that give you some breathing room for a couple of years. Because the car is electric and some of the current tax benefits, the Leaf could be essentially free- and that doesn’t even count what you save on gas. 5. Have your significant other tell you where they spent money…and you do the same. For the majority of us, accountability is a great motivator. Generally, when you tell someone you’re going to do something or when someone who is holding you to a particular task, you are more likely to follow through. That accountability factor is a huge factor in keeping us from spending frivolously. Do you find yourself living paycheck-to-paycheck? Challenge yourself to take at least two of these intermediary steps this week to put yourself on the path to change.